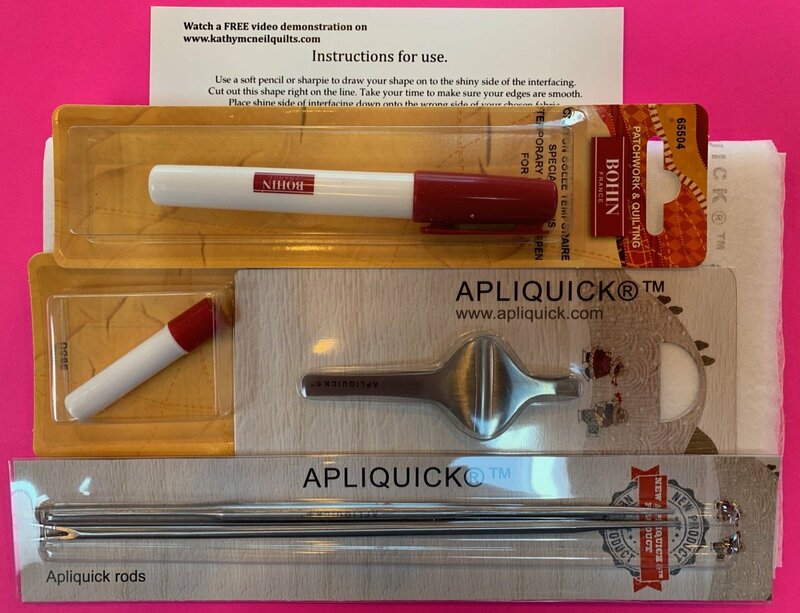 This sale price kit provides everything you need to get started with the Easy Apliquick method for turned edge appliqué. You will save $ 8.19 of the list price of all included items by buying the kit. Foundation stabilizer- 0.5 SQUARE meters. This lightweight stabilizer has one side that irons onto your fabric for ease of cutting the desired shape. Use a fine point sharpie marker or soft pencil to make your pattern lines directly onto the shiny fusible side. "No need to use the mirror image!!!" Draw each required shape. Cut out of foundation paper directly on your line. Iron on to the wrong side of your fabric. Cut shape out of fabric with approximate 3/16 seam allowance. Lightly glue the inside edges and use your turning rods to press over the foundation paper for a PERFECT finished shape ready to applique to your background. New Easy Grip thicker turning rods - You will be astounded with the ease of turning edges with these amazing, almost surgical tools. The fork on one allows you to hold the small piece in place while the other beveled rod is used to brush the fabric over the edge of the foundation paper. Use a glue pen or stick to add a slight smear of water dissolvable glue along seam line. Use the pointed ends of your rods to flatten out any puckers or ripples so that everything lays nice and flat. I love, love these tools for any complex small shapes that I need to be precise.!! They are thicker thru the middle to make it easier to grasp. The price did increase a little because each rod has to be individually lathed to the tapered end with the bevel and the point. Tweezers - These ergonomic tweezers have beveled points. The wide base allows for a firm grip with your fingers even when you have a bit of arthritis in your thumb. Amazing little scooping shovels for those small piecies! One Bohin glue pen and refill. Glue pens use less glue with their narrow diameter. This glue is soft and come in pink, so you can see where you have placed it. It will dry completely clear. See free video - click here for a demonstration of this easy and precise method of turning your edges. Turning your edges and finishing them by hand or machine allows each piece to have more loft and dimension than fusible appliqué. Fused appliqué lays much flatter as it is all glued to the background. Fusibles can also prematurely age your fabrics by discoloring them and making the fibers brittle. I am so in love with this new method of applique. It allows everyone to quickly be able to master those smaller complex shapes that need to be more precise. I promise you will love it too.